The killing of a rare white "spirit" moose, considered to be sacred by some Canadian aboriginal groups, sparked outrage Thursday. But the hunters at the center of the controversy said they had been unaware of its significance and are trying to make amends. The animal was shot last week in Nova Scotia. It was brought to Hnatiuk's Hunting & Fishing Ltd. in the town of Lantz, which snapped a photo of the carcass and posted it on its Facebook page. The page received 10,000 hits within three days as news of the animal's death went viral, with online postings berating the hunters as "idiots" and "ignorant" with "no respect or common sense." Emotions expressed on Facebook and in Twitter messages throughout the day ranged from sadness to anger. "I cannot believe anyone could kill such a beautiful creature. I guess they think they are really big men now. Shame, shame, shame," said one post. "How can something that is so sacred and honored by the community be a trophy?" commented a fellow hunter who described being devastated and in tears. "When something is so rare in nature, just leave it alone," concluded another. The owner of the taxidermy shop, Jim Hnatiuk, told AFP he spoke with the hunters: "They said, had they known the significance of this they wouldn't have shot the moose." "Some people believe that shooting a white moose is bad luck, but the hunters were totally unaware of its significance," he said by telephone. "Everyone is a lot more knowledgeable now, and the hunters want to make amends and fix this as much as they can." The three local hunters, whose names were withheld, have apologized to the local Mi'kmaq tribe and agreed to hand over the hide for a ceremony to honor the animal and dispell a curse. The ceremony is planned for next week and could last several days. The hunters meanwhile will keep the bull moose's head as a trophy. White moose are not legally protected, but they are very rare. 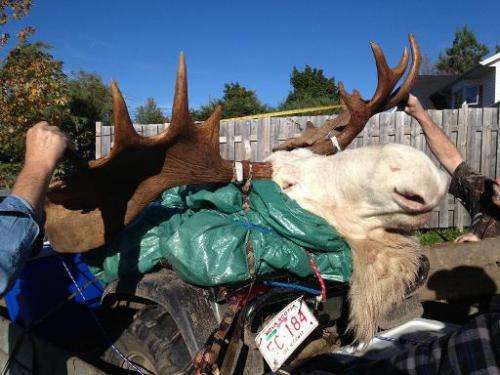 Natural Resources officials said the moose was probably a partial albino, based on photographs. This particular animal was known to have inhabited the Nova Scotia highlands for several years and had been spotted often by locals. "It was very graceful to see," a Mi'kmaq chief told public broadcaster CBC. Mi'kmaq hunter Danny Paul added: "We are not to harm them in any way, shape, or form, because they could be one of our ancestors coming to remind us of something significant that's going to happen within our communities." Killing the animal, he explained, brings bad luck and misfortune. "It was so disrespectful, having seen it put on the social media," Paul said, adding "our people are outraged."